Plastic Soldier Review - "The One Inch Army II"
Home > Features > "The One Inch Army II"
"The One Inch Army II"
2002 was something of a landmark year for 1/72 scale figures, for apart from seeing the birth of our own humble website it was the year the world was given "The One Inch Army", the first book devoted solely to the subject. We reviewed it at the time (see our article here), and described it as "...the most comprehensive study of the hobby ever published". And so it was, but a lot has happened in the last decade, so now Victor Rudik has published "The One Inch Army II", a totally reworked and expanded volume that both brings the story right up to date and greatly expands its coverage. The first thing that strikes you about this book is it is a whopper! 850 pages no less, and at 210mm by 276mm each page is practically A4 size. Yet there are none of the tricks seen in some books where wide margins and blank pages help to fill out the contents. Every page is packed full of material, so this is a book bursting with information. As the title says, this is a definitive guide, so it covers everything already included in the first book. Obviously there have been a lot of new sets and not a few new manufacturers over the intervening years, but this is far more than just an expanded version of the earlier work. Each manufacturer still has their own section, but this time there are many more good-quality black-and-white photos of the figures, accessories and often the packaging too. There is often more detail about the manufacturer too, but one of the major aspects of the new book is the inclusion of so many more manufacturers than before (a total of 851). Some of these never made a figure, but all made accessories or some other item that would be of interest to modellers in 1/72 scale or thereabouts. Fantasy and Sci-Fi are not missed out, and also included are battle-sets, games and just about anything else that delivered at least one figure in our favourite scale, so the coverage is very wide indeed. As before there are many manufacturers that have long disappeared, and the author has managed to track down not only their products but also remarkable information about many of them. For many people today the only glimpse they will get of these very rare products will be in these pages, so whether you aspire to gain ownership of some of them, or simply enjoy seeing what was made in years gone by, this book will go a long way to satisfy that interest. New Figure Ideas - A lengthy list of what the author, and many of us, would like to see made in the future. Manufacturers Directory - the bulk of the book, lavishly illustrated. Box Art - a glorious 48-page full-colour section showing packaging and artwork from all the major and many minor producers over the years. Unknown - A gallery of figures and items not yet fully identified. Painting and Conversion - Good advice on making the most of your figures. 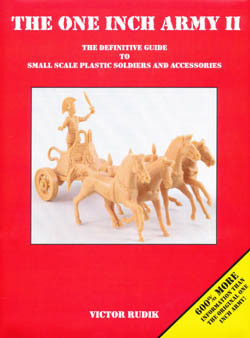 Toy and Soldier Shows And Auctions - A directory, mostly in North America. Conclusions, Internet References and Contacts. All of these are well-written, informative and interesting, but inevitably it is the exhaustive directory of manufacturers and their products that the reader will keep coming back to. The many hundreds of black-and-white photographs make this a book that works well if you simply want to browse products both familiar and unknown, yet remains an essential encyclopaedia for the hobby in all its facets. Overall this book is a feast for both the eyes and the mind, and a magnificent achievement which we can heartily recommend. For obvious reasons you are unlikely to find this book on the shelf in any mainstream bookshop, so to forestall any individual requests for information on availability etc., we include the following details. The book’s ISBN is 9780973051711 and is published by Victor himself. A number of hobby dealers are expected to stock it, but for more information it is best to contact the author and publisher at theoneincharmy@hotmail.com.